Lunch will be catered starting at 12 noon – plates are $12.50 per person. Please RSVP with the form here. Door prizes will be drawn between speakers and during lunch. For the first time ever, a two-volume Annual! Volume I is full of stories about John McElroy of the McElroy Ranch in Crane, Upton and Pecos Counties, Texas. Volume II has more stories of John McElroy and the story of the Cowboy Keltons by six-time Spur Award winner Elmer Kelton himself. Brenda Sue Ann Johnson Damron, 70, of Big Spring, Texas died Aug. 30, 2017. Sue Ann was born to Chester Allen and Freda Mae Pearl Johnson on Dec. 7, 1946, in Frederick, Maryland. Funeral services will be held at 10 a.m. Saturday, Sept. 2, 2017 at the Nalley-Pickle & Welch Rosewood Chapel. Interment will follow at the Coahoma Cemetery. She enjoyed her childhood in Lander, Maryland and had many fond memories of spending time on her beloved grandfather’s farm. It was from him she learned to love history and family stories from the past. She graduated from Frederick High School in 1964. She attending the University of Maryland for a short while and then moved to Big Spring, Texas in 1966. She worked at Cosden Refinery for several years and that is where she met the “cowboy of her dreams”, John Roy “Tom” Damron. John and Sue Ann were married on June 30, 1967, and just recently celebrated their 50th wedding anniversary. She graduated from University of Texas Permian Basin in 1975 and began her teaching career. She taught at Immaculate Heart of Mary Catholic School until it closed; and then was an 8th grade math teacher at Runnels Junior High School for 14 years. She loved her country, her cats, the Dallas Cowboys, and anything to do with history and genealogy. She had many great adventures with her family and friends over the years. She enjoyed visiting her home state of Maryland every summer and had many memorable vacations with her sister, Lorraine Johnson Davis and her family. She also enjoyed going to Salt Lake City to do genealogical research at the Mormon Library. She loved spending time with her only daughter, Anne Damron Witherspoon; and her adorable grandchildren, John Aaron and Ellen Witherspoon. She was a charter member, former Regent and current Registrar of the Daughters of the American Revolution Captain Elisha Mack Chapter. She documented 29 Revolutionary War patriot ancestors for herself and her daughter. Sue Ann was a long time executive committee member of the Permian Historical Society, serving as secretary for the past 14 years. She also served as secretary for the Howard County Historical Commission. She was a national officer of the Society of the Descendants of Washington’s Army at Valley Forge. She was a long time volunteer at the VA Hospital and was recognized with the West Texas VA-Legion of Honor Award and the Outstanding Woman Volunteer of the Year; and she was named the Texas Society DAR Service for Veterans Outstanding DAR Member Volunteer. She had recently been named to The Heritage Museum’s Board of Trustees. She had a brilliant mind, a great sense of humor and was tough as nails. She will be deeply missed by all who knew her. She is survived by her husband, John “Tom” Damron of Big Spring; daughter Anne Damron Witherspoon; son-in-law Jonathan Witherspoon; grandson John Aaron Witherspoon; and granddaughter Ellen Witherspoon – all of Lucas, Texas; mother Freda Mae Pearl Johnson and sister Lorraine Johnson Davis, both of Frederick, Maryland; and “twin” and childhood friend, Dottie Britton of Big Spring, Texas; and many other beloved family members and friends. The family requests in lieu of flowers that donations be made to The Heritage Museum, 510 Scurry Street, Big Spring, Texas 79720. Arrangements are under the direction of Nalley-Pickle & Welch Funeral Home and Crematory. Online condolences may be made at www.npwelch.com. The Spring Meeting of the Permian Historical Society was held at the Polo Park Estates in Midland, Texas. Thirty-four members and guests were present. Registration began at 9:00 a.m. with breakfast treats provided by the facility and books and past PHS annuals available to purchase. The costume theme was Hee Haw and photos were taken of those participating. The meeting began at 10:00 a.m. with a hearty welcome from President Peggy Kelton. She announced that our Fall Meeting will be in Ft. Stockton on 17 October 2015 and will be hosted by the Pecos County Historical Commission. Jim Collett was introduced as the person who is going to revamp our membership roll. Anyone who had not paid their 2015 dues to date was urged to do so today. The minutes of the 2014 Fall Meeting were approved as printed. The first presenter was Barbara Barton who gave a power point program on The Indians of the Concho Area. Some tribes, such as the Seminoles and Cherokees, came to Texas from other states while the Jumanos and Comanches were longtime inhabitants. Many individual Indians’ exploits were related and their part in Texas history revealed. The second program was presented by Emily Barton whose family were the first Hispanic residents of Crane. She emphasized the work life of her father, Leonard Andrew Hernandez, and her own experiences as a student in Crane. The artifacts and family photos which accompanied her presentation made it most interesting. Bill Modisett gave the last presentation, which was about Ector County rancher Jim Parker. He started ranching in Andrews County in 1907 and eventually owned four ranches in Andrews and Ector counties. One of his ranch hands, Dub Riley, has provided much information to historians on this remarkable Permian Basin man. Mr. Modisett also announced that a PBS documentary on Permian Basin philanthropist Dora Roberts is in the works. 2007-2008 calendars featuring the Parker Ranch were there for the taking. Scott Jordan brought Pecos Trails travel guides for everyone at the meeting and extras to place in area museums and libraries to promote tourism in the area which, in turn, will generate revenue. A.L. “Bud” Lindsey was announced as the winner of the Fall Meeting 2014 Best Presentation award for his power point program on The Convent-Monastery in Stanton. Attendees were instructed to vote for the program they thought was today’s best presentation and turn in their ballots to Donna Bell. J. Tillapaugh presented an honorarium to our editor Jim Collett on behalf of PHS for his many hours of devoted service in getting our annual out. J. Tillapaugh then presented the first Public History Awards given by PHS to the Heritage Museum in Big Spring, director Tammy Schrecengost accepting; to the Museum of the Desert Southwest in Crane, curator Genny Townsend accepting; and to the UTPB Conrad Dunagan Library’s Special Collections, Howard Marks accepting. 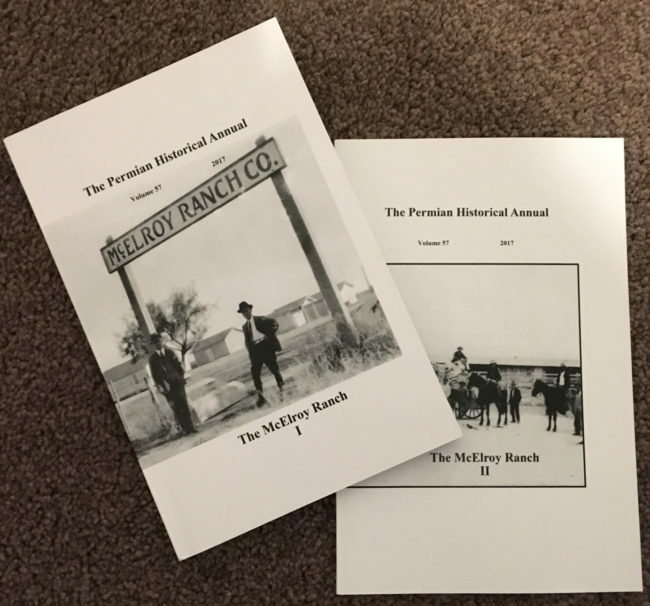 J. explained that PHS hopes these awards will be presented annually to celebrate the importance of the contributions local repositories of the area’s history make to the overall history of the Permian Basin. Door prizes were won by Lane Bond, Tammy Schrecengost, Sue Ann Damron, Evelyn Stroder, and Genny Townsend. The meeting was adjourned and followed by lunch, compliments of Polo Park Estates. Bobbie Jean Klepper, of Fort Worth, Texas, died Sunday, November 9, 2014, at Community Hospice in Arlington, Texas. She was 81 years old and had battled declining health for several months. Born on August 1, 1933, in Matador, Texas, Bobbie Jean, as she was known to her family, was the eldest of three daughters born to Robert Franklin and Florence Alice Pruitt. Mr. Pruitt was a widower with a son and a daughter when he married Florence. Bobbie Jean was married to Robert Junior York in 1950 and divorced from him in 1969. They had four children, two daughters and two sons. She married Richard Edward Klepper in 1971, and their marriage lasted until his death in 1991. They had one son. Insatiably curious and loving learning, Bobbie Jean graduated as Salutatorian of the 1950 Senior Class of Nocona High School. When she was in her early thirties, she started working toward a college degree, taking one or two courses at a time, nights and weekends. She earned a Bachelor of Arts Degree in history with a teacher’s certification from the University of Texas of the Permian Basin in 1975, followed in 1977 by a Master of Arts Degree in history, also from UTPB. In 1989 she earned a Master of Library Sciences Degree from the University of North Texas extension program at Texas Tech, and she was pursuing a doctoral level degree at Texas Women’s University in 1997 when not one, but two, strokes forced her to slow down a bit. Bobbie Jean was passionate about history and historical preservation. She was employed as a graduate assistant in the archival collections housed at UTPB as a student, and she eventually progressed to Archivist/Special Collections Librarian, a position she held for more than twenty years. She and her archives were resources valued by students, researchers, journalists, and authors; and her font of information and entertaining presentation made her a popular choice as a speaker in professional, educational, historical, and religious venues. She often said that she fell in love with archival work and was thrilled that someone was willing to pay her to do something she loved so much that she would have done it for free. Her enthusiasm was contagious, and several of her student assistants actively procured for the archives the donation of county records, photographs, and other items of historical significance. One of her students became a museum curator. Through her involvement with the Permian Historical Society, Bobbie Jean was instrumental in the procurement, preservation, and restoration of the White-Pool house, the oldest existing residence in Odessa, and the preservation of the historical home of the Henderson Drug Store. She was active in numerous organizations and held offices in the Permian Historical Society, White-Pool House Friends, Ector County Historical Commission, Odessa Cultural Council, Heritage of Odessa Foundation, and University Library Friends. She received the Heritage of Odessa Foundation Community Statesman Award in the field of Humanities in 1991 and the Permian Historical Society Academy of History Award in 2001. In addition, articles she wrote that were published in the Permian Historical Annual received the Best Article Award given by the Society in 1980 and again in 1998. Bobbie Jean was a life-long follower of Jesus Christ, having accepted his offer of salvation during Vacation Bible School when she was eight years old. Her desire for Christian fellowship led her to intimate involvement with her church. She was a long-time member of Second Baptist Church in Odessa, Texas, where she served as church librarian for fifteen years. She also taught children’s and ladies’ Sunday School classes, led Bible study groups, held offices in the Women’s Missionary Union, directed the Girls’ Auxiliary, served on a pastor search committee, and, of course, assisted with Vacation Bible Schools. At the time of her death, she was a member of Lamar Baptist Church in Arlington, Texas, and a valued participant in her Sunday School class. She was preceded in death by her parents; her husband, Richard Edward Klepper; her daughter, Kathryn Ann York; her half-brother, R. F. Pruitt; her half-sister, Mattie Lou Messick; and her sister, Wanda Ruth Graham. She is survived by four children and their spouses, Susan Kay Bowman (Stan), Robert Allen York (Ginger), John Michael York (Charleen), and Richard Samuel Klepper (Lori); and her sister Martha Rose Grant; six grandchildren; and thirteen great-grandchildren. The Fall Meeting of the Permian Historical Society was held in the parish hall of St. Joseph’s Catholic Church in Stanton. There were 36 members and guests in attendance. Registration began at 9:00 a.m. The Board Meeting began at 9:15 a.m. Presentations began at 10:00 a.m. with a welcome from President Peggy Kelton and host Bud Lindsey. Evelyn Stroder then introduced each speaker beginning with Beverly Weatherby Farmer who spoke on Growing up under the Jail in Crane, Texas. Next, Bill Kelton told the story of John T. McElroy, Rancher. As the third scheduled speaker had not arrived, Tumbleweed Smith entertained with humorous anecdotes from various interviews that he had done through the years. He managed to coax cowboy-poet member Tom Koger to recite a couple of his compositions to the delight of the audience. Bud Lindsey then gave an informative power point presentation on The Convent-Monastery in Stanton. A delicious Mexican lunch prepared by the ladies of St. Joseph’s church was served with Elodia Bravo’s famous pound cake for dessert. As John Vaughan had arrived, he presented his program The Rankin Beach. Attendees then cast their ballots for today’s Best Presentation award. A certificate for Best Presentation at the October 2013 meeting was presented to Janie Harrison for her program Dr. J. W. Barnett, Pioneer Big Spring Physician. Jim Collett’s article Downhill from Upland: How the Road to Nowhere Created Several West Texas “Somewheres” was awarded the Best Article award for 2013 and Janie Harrison was awarded the 2014 Best Article award. The first round of door prize tickets was drawn. The membership business meeting began at 12:30 p.m. Lane Bond moved that the slate of officers presented by the Board be accepted by acclamation. The motion was seconded and passed. Only one office was filled by a new person – the two VP offices were combined and our new VP is Betty Damron. Evelyn Stroder moved that the Board’s recommended slate for the Board of Directors be accepted. The motion was seconded and passed. The members elected were: Genny Townsend – Crane County, Beth Hoover – Crockett County, Ruben Vasquez – Ector County, Roger Goertz – Howard County, James Collett – Midland County, Earnest Woodward – Pecos County, Carolyn Hodge – Reagan County, Barbara Barton – Tom Green County, and Donna Bell – Upton County. Investments Chair J. Tillapaugh reported that PHS is in great financial shape. The last round of door prize tickets was drawn. President Peggy Kelton announced that the Spring Meeting would be held at the Petroleum Museum on the third Saturday in April 2015. Attendees were thanked for coming and the meeting was adjourned. Please Email the Webmaster if you would like to provide content or comments on the website.